Working front post and back post stitches in crochet is an easy way to give texture to a crocheted piece. Front post and back post refer to the way the crochet hook is inserted into the work when crocheting and can be done using different stitches, such as single crochet, half double crochet, double crochet, treble crochet, etc. 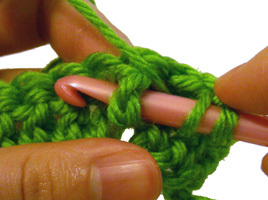 Instead of inserting the hook into the front and back loops of a crochet stitch as one would normally do, front and back post stitches are made by inserting the hook around the post of the stitch. For front post stitches the hook is inserted into the front of the work, behind the stitch, and then through the work such that your hook is now at the front of your work again. For back post stitches, the hook is inserted through the back of the work, across the front of the indicated stitch, then through the work again, such that the hook is at the back of your work again. These tutorials demonstrate the basics of front post and back post using double crochet, but remember that other stitches can be used to create texture as well. Feel free to experiment with different stitches using the same front post and back post concept to get different looks. This entry was posted on Thursday, July 15th, 2010 at 5:00 AM by Rachel Choi	and is filed under Tutorials and Help. You can follow any responses to this entry through the RSS 2.0 feed. You can leave a response, or trackback from your own site. I’ve now done 2 bags since discovering the FPDC and BPDC. I love FPDC’s!! Working on the Bobble Along Aran Tote front panel. 2nd try after giving it a frustrated rest first try. Biggest issue is getting into the right stitch after (double) FPDC. Skipping the post stitch loops to keep stitch count right vital and things go off track pretty fast if you don’t get that stitch after the Post dc right. I was so happy to find the Front Post Double Crochet instructions. I purchased a man’s hat pattern 6 months ago and never could find out to make the Front Post stitches. Thank you so much. You are a life saver. It’s still here on post that say it is. If your computer is slow, then it might load slow. Oooh, okay, it’s just not on this first main picture but it’s on the instructions. As a serious lefty, I can’t even begin to say how helpful those pictures have been — my crochet lifesavers,indeed! Thanks again!! Thanks for the directions on how to front post double crochet and back post double crochet. I just learned two new stitches. Keep up the good work!